EnterpriseROR's PIP Module is a real-time, web-enabled investment performance calculation engine and reporting system specifically designed to seamlessly integrate and operate behind the secure firewall of an account access website application. PIP is a specialized development platform intended for building or augmenting enterprise-level investment performance reporting applications. Who Should Use EnterpriseROR PIP? The PIP system is a performance reporting and investment personalization system. The detailed performance picture rendered by PIP enables firms to offer engaging and high quality performance reporting and investment personalization to their retirement plan participants and retail investors, investment advisors and brokers via their account access website and investor statements. Capable of meeting the budget of even the most cost-conscience firms, financial institutions and service providers, dailyVest's PIP Module provides the competitive edge required in today's marketplace. Customizable charts and tables can be generated to communicate personal performance results including net investment vs. market value, cumulative historical returns, annualized returns, monthly, quarterly, yearly, year-to-date, multi-period and custom period returns, geometrically linked returns and benchmark comparison charts and tables. EnterpriseROR even calculates investment returns for proprietary funds and securities. "Investment Personalization" refers to personalized investment information not falling under the category of personal performance. Data needed to calculate personal rate of return information can also be used to analyze and display virtually any other element of useful investor information. 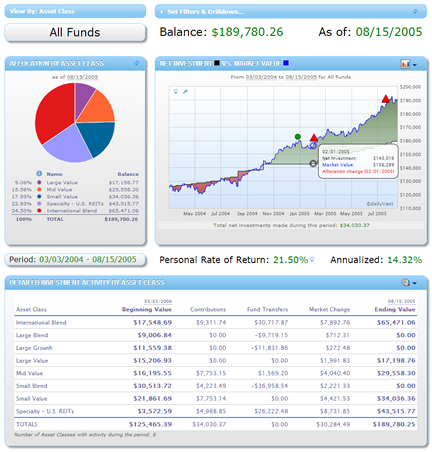 This includes tables of current holdings, transaction history lists, standard deviation (also known as Risk) -- a measure of a portfolio's volatility, charts showing balance history, pie charts showing the breakdown by investment and asset class, pie charts depicting historical vs. current asset allocation, model portfolios, security price history charts, and an account activity table summarizing beginning value, intermediate transaction types and ending value. These are just a few. Furthermore, users can select any time period for which analysis is desired. Pie charts are even designed to render breakdown of the portfolio/account/plan by asset class, individual holding or other security attributes "as-of" any previous date. The PIP Module adheres to calculation methodologies recommended by the Investment Performance Council of the CFA Institute (formerly the Association for Investment Management and Research or "AIMR"). Specifically, calculation methodologies are consistent with those specified in the Global Investment Performance Standard, or "GIPS" standard. In addition to the GIPS-recommended Time-Weighted Rate of Return methodologies implemented by the FOM (including Modified-Dietz and Daily Valuation), the Dollar-Weighted Rate of Return method (a.k.a. "IRR") may also be set for calculating investment returns. Interactive, customized personal rate of return for account access websites. A powerfull plan sponsor reporting solution using big data technologies. On-demand & batch-generated custom electronic account statements. Ensures the same personal rates of return are on the printed statement and the website. Our code powers some of the largest financial service brands in the US. Contact a dailyVest representative and setup a demo today.